Setareh NAJFAR-NAHVI started her violin studies at the Tehran Conservatory and was a member of the Tehran Radio Orchestra and the Tehran Symphony Orchestra from 1978 to 1983. From 1984 onwards she continued her concert violin studies at the Music University of Vienna in the class of Prof. Michael Schnitzler, at that time first concertmaster of the Wiener Symphoniker. From 1987 to 1989 she was awarded a scholarship by the Austrian Ministry of Culture. In addition she completed her pedagogy studies at the Tyrolean State Conservatory. Furthermore she completed several training courses concerning breathing and relaxation techniques during her studies, lasting multiple years. She passed her studies with unanimous honors. 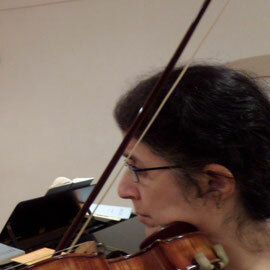 Moreover she participated in many master classes including those of Igor Oistrach, Josef Suk. Her work as a soloist and her chamber music activities led her to travel to many countries like Germany, Denmark, Belgium, Italy, the Netherlands, Switzerland and France. An intense involvement with contemporary music was followed by cooperations and premières of various works of componists like Karlheinz Essl, Reza Najfar, Martin Lichtfuss and Norbert Zehm. Setareh Najfar-Nahvi was a long-time member of the Tonkünstler Chamber Orchestra for many years and also played in other orchestras such as the Wiener Kammeroper, the 1. Women's Chamber Orchestra in Austria and the "Ensemble 86" for contemporary music. She has worked with acknowledged conductors such as Claudio Abbado, Kurt Rapf and Sir Neville Mariner. From 2002 to 2004 she was a member of the Tyrolean Symphonic Orchestra in Innsbruck. Currently Setareh Najfar mainly dedicates her time to teaching violin and the performance of chamber music with pianist Theresia Schumacher, with a focus on rarely performed literature for violin and piano. She also is a co-founder of the Ensemble Triophonus Viennensis, consisting of flute, violin and piano or cembalo with Reza Najfar and Theresia Schumacher. Since August 2013 she is an active member of the Austrian Global Music Vienna society. The CD "Female Composers, Pieces for Violin and Piano" was published in July 2016 and received positive feedback both from the media and the audience.There have been several concerts with this CD’s programme in different European cities, including Milan, Saarlouis, Hombourg-Haut and Freiburg im Breisgau. Setareh Najfar-Nahvi was featured on a CD by composer Reza Najfar which was published 2014 in Tehran. This CD included the recitation and scoring of poems of Iranian author Esmail Habibi. In November of 2017 a second CD named "Exiled Music" with works by Erich Wolfgang Korngold, Nikolai Roslawez, Reza Najfar, Alfred Schnittke and Egon Wellesz was released under the label "Austrian Gramophone". Both the CD “Female Composers, Pieces for Violin and Piano”, as well as “Exiled Music” were broadcast on radio channels such as Ö1, Radio Klassik and SR2. In May 2017 Setareh Najfar-Nahvi and Theresia Schumacher gave a concert for the Institute Théodore Gouvy in Hombourg-Haut with works by Théodore Gouvy and an excerpt of her CD "Female Composers, Pieces for Violin and Piano". In December 2017, together with the Ensemble Triophonus Viennensis, Setareh Najfar-Nahvi performed the trio version of E.W. Korngolds ballet-pantomime "Der Schneemann" in the Brahmssaal of the Wiener Musikverein. Furthermore, she is giving master classes in various cities in Europe and Asia. Her pedagogical focus areas are practising efficiently, avoiding tension and fast technical development whereby musical sense is always the main focus. 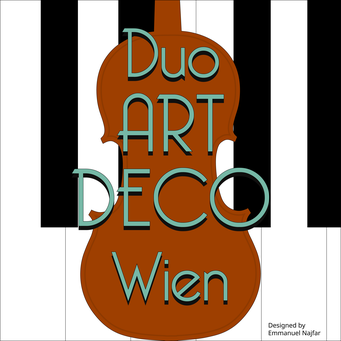 Setareh Najfar-Nahvi and Theresia Schumacher perform under the name "Duo Artdeco Wien". Since the winter semester 2013 she is teaching at the Prayner Conservatory of Music and Dramatic Arts in Vienna. Setareh Najfar-Nahvi plays on a Celeste Farotto violin from the year 1939. To the website of the "Ensemble Triophonus Viennensis"